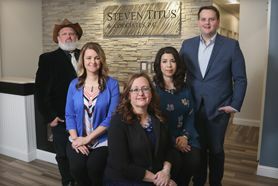 Testimonials - Steven Titus & Associates, P.C. Wonderful dedication to their clients and attention to detail! If you are looking for an attorney who will fight for your interests, explore and examine every possible option in your case, and be your advocate, you must choose Steve Titus! Steve is an excellent judicial mind paired with a honest, direct and solid human being. You won't find a better legal mind or advocate! They will do their best for you. I would recommend them. There is no one else that you would want in your corner. Hire them! Great Attorney, and definitely one of the best offices in Wyoming. The best attorney in Gillette!